Finding the right set of binoculars is like finding the right car. Or the right fast food hamburger. Or the right spouse. It can take a lot of trial-and-error, some near-misses, and some total junk, but in the end, if you persevere, sometimes, just sometimes, you find a keeper (Image 1). The APM 82-mm 90-degree ED-Apo binoculars I tested out at the beginning of the year, well…they’re my soulmate. Big, but not too big, clean and almost totally chromatic aberration-free, and with the easy ninety-degree angle that makes sitting in a chair and relaxing while viewing so very very seductive, these babies hit all the marks. For me. But let us begin at the beginning…. The 82s (as henceforth they will be called, and not My Baby, or She Who Shall Be Observed With) are made with a magnesium housing to keep the weight to a manageable ten and a half pounds (with handle, an easy one-handed size), with a 470 mm focal length, extendable dew shields, waterproof and nitrogen-filled (I don’t observe in the rain, but hey, you never know), twin helical focusers that take any size 1.25-inch eyepieces, two elements/two groups of FPL53 ED fully broadband multicoated lenses with a max FOV of about 3.4 degrees and a pair of 18-mm 65-degree Ultra Flat Field eyepieces (I also grabbed a pair of 24-mm 68-degree eyepieces, as well). 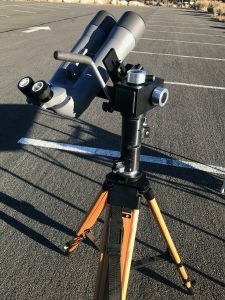 They mount with a regular tripod adapter (holes on an armature on the bottom), and I stuck them on one of the last made Universal Astronomics MacroStars (there’s also a very compact single-arm center mount that APM sells, as well). Easy to point, easy to view, easy-peasy. First test in a winter of weather discontent, was simply to take the 82s out to the front sidewalk right after sunset and look at the first quarter Moon (Image 2). I even brought a folding camp chair. Now, I haven’t been much of a visual observer since I was a kid (I’m an imager with the handy-dandy pair of wide-field binocs to keep me company, while my computer does all the work), but I do like to look through a good scope now-and-then when others have them available. But taking time to observe on my own, it’s been a while. Not that night. I looked in at the Moon, and suddenly, an hour had gone by as I was so enthralled by the image (in both sets of eyepieces), I seriously lost myself in the 3Dness and clarity of it all. Was there chromatic aberration? A bit, but it was variable to a smidge of greenish yellow in one set of eyepieces and a slice of purple in another, and only on fluctuating edges of the Moon, depending on where in the eyepieces I had it. What’s more, as the sky darkened (and maybe the binocs became acclimated to the temperature), even that went away. I would never see this again on any other object, or at any other time. The eyepiece placement (adjustable, of course) really worked for me on the 82s (as they hadn’t as well on the larger 100mms I’d tried a year or so earlier), and once fixed, I was mesmerized. Image 3 – Mark’s fellow astronomer, David Novick, who has the 100-mm brother to the APM 82s. It was a pretty dang-good night: cold but steady with no wind and a lot of people having pulled their scopes out after a bad winter. As dark really hit, I turned the 82s to M42 and M43 (and a few more times as the night wore on, as well). It was a wonder. Four stars in the Trap, no problem. Wings of nebulosity, you betchum. When viewed through David’s 100mms, consistently similar (except for FOV, of course), with the 100s going slightly deeper when pushed, but not by much. Contrast was similar, dark background similar. Both keepers, but I liked the slightly wider field of the 82s, because I’m a widefield junkie. Next up, M45, the Pleiades, that singularly scattergun of bright and dim stars that hang in the night like spangles on a Vegas showgirl. Stars, stars, stars. Pinpoint and clear, contrasted against the dark background with a 3D feel that only binoculars can give. And so comfy on the 82s to view through. Just stunning. Then to M41, which clustered out nicely in Canis Major. Then to Sirius, and the only differences we found between the 82s and the 100s. Sirius looked just a smidge bluer in the 100s than the 82s. David and I both could see it, though it wasn’t much, but it was there. Why? Who knows, but that was it as far as color and contrast differences that we could see. 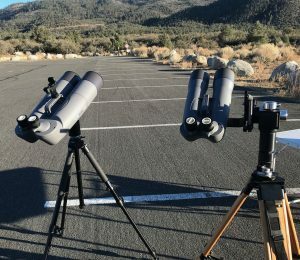 Image 4 – APM’s 100-90 ED Apo Bino (left) set up to compliment a night of observing with its 82-90 ED Apo sibling. Onto M46 in Puppis and planetary nebula NGC 2438 hinted at, as well as M47 right near it. Back to M42 and M43, which as the night got later, just got better and better, the nebulosity starting to really stand out in roils and cables. Then up to the Double Cluster in Perseus, which was perhaps better in the 82s than the 100s due to composition in the wider field. Thus began a trek through the northern Milky Way: M52 in Cassiopeia, the usual “diamonds on velvet,” into M103 and some major star fields working up to Perseus where the Double Cluster captured the attention again. After grabbing a coffee, I then spotted M44 with my eyes and jumped over to that in the 82s, picture perfect, then over to M67, also in Cancer, then went to the clusters of M35 in Gemini and M36, M37 and M38 in Auriga to fill out the night. It was cluster overload! And there you have it, my chosen ones, the 82s, in all their glory. 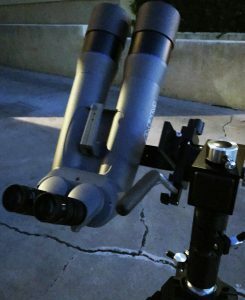 If you like big binocs with wide fields, the ability to swap out eyepieces, light enough to grab in a hurry and mount light, while still going deep, you should give these a try (or even the 100mms). At 1839 Euros at APM, they’re spendy, but reasonable. Really quite the sweet spot. But get your own: you’ll have to pry these out of my cold dead fingers (Image 4). My thanks to Markus Ludes of APM for getting me a pair (which I promptly bought after reviewing them), as well as always being helpful to my questions, and to David Novick for bringing his 100mms to share in the night sky. Fun times were had by all. 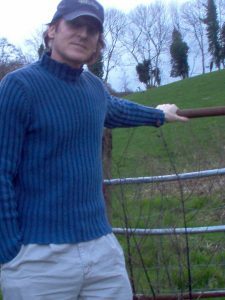 Mark Zaslove is a two-time Emmy Award winner and recipient of the coveted Humanitas Prize. 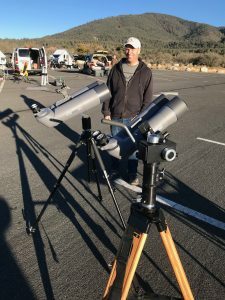 Mark is a born-again astro noobie, who once had an Optical Craftsman scope as a kid, and is now recapturing his youthful enthusiasm (with a digital twist) and having a lovely time doing it.